With the release of its 2009 product series , the core focus warms the cockles of our heart: speed. Far from just refining its previous bulky offerings Symantec has completely rewritten the tools from the ground up for ‘zero impact’ performance and its claims are remarkable. Norton AntiVirus 2009 has a leaner footprint, improved speed, white listing, and other technologies to mark clean files as trusted, and free technical support.It Protect your PC from viruses, hackers and privacy threats. Millions of users worldwide trust Norton products to provide a safe computing experience. Norton brand of consumer security solutions deliver Internet security and problem-solving capabilities to individual users, home offices, and small businesses. The Norton brand of products is a market leader in desktop protection, with integrated products that work seamlessly to protect customersâ€™ computers from virus outbreaks and malicious attacks. NEW! Proven fastest security suite availableâ€”Spend more time using your Computer and less time waiting for your security software to perform. 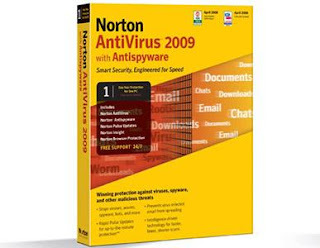 Norton AntiVirus 2009 hits all the right performance notes and its award-winning protection technologies should start to win back even jaded anti-Symantec folks. We love its sleek build, performance speed, and array of quality security tools. Our only fault remains with the products lackluster online consumer technical support.